Home Airlines JetSuiteX Orange County launching soon! JetSuiteX is one of my favorite flying experiences. Flying with JetSuiteX is an affordable luxury that beats any domestic short-haul flights offered by the big guys, but at a price comparable to an economy flight. Starting on June 29, 2018, JetSuiteX Orange County flights will be available between John Wayne Airport and Las Vegas! Read to the end to find out how you can save $20 on your next JetSuiteX flight. JetSuiteX offers a flight experience that is unparalleled for the price. You’ll be flying in a 30-person semi-private jet for around $100 each way. Aboard the airplane, JetSuiteX offers complimentary in-flight wi-fi, gourmet snacks, and craft drinks. The plane itself has a 2-1 configuration with 10 rows of seating. And before you depart, you’ll relax and enjoy the private terminal without dealing with all of the chaos of the TSA security checkpoint. Just sit back, relax, and enjoy some snacks as you wait for your flight. This is what your TSA line will look like. JetSuiteX continues to expand and now offers flights from Burbank, San Jose, Oakland, San Francisco (Concord), and Las Vegas. And seasonal flights are available on JetSuiteX as well. Mammoth Mountain flights are available all winter for hitting the slopes. Limited time only flights to Sundance Film Festival, CES in Las Vegas, Coachella Music Festival, and select college game day locations offer great value. Starting June 29th, you’ll be able to fly JetSuiteX Orange County to Las Vegas. They operate 3 different flight schedules out of Orange County. On Fridays, there are 3 flight options at 9:05 am, 12:45 pm, and 5:20 pm. That 5:20 pm flight would be a perfect way to start the weekend after a long week of work! And there are 2 flights available on Saturday and Sunday out of John Wayne Airport. Saturday flights leave at 11 am and 2:10 pm, while Sunday flights depart at 10:25 am and 5:15 pm. During the week, JetSuiteX Orange County offers 2 flights a day to Las Vegas. Monday through Thursday, flights depart Santa Ana/John Wayne Airport at 9:30 am and 4:15 pm. If you haven’t tried JetSuiteX before, you can save $20 when you use my referral link and promo code “PFVEEV“. JetSuiteX will occasionally offer discount fares as low as $69-$99. But this discount code is only good on flights of at least $129. I’m excited that JetSuiteX is expanding in my backyard. I would go out of my way by driving to Burbank from Orange County just so I could fly semi-private on JetSuiteX instead of Economy on Southwest or one of the other big airlines. JetSuiteX Orange County will eventually offer more flight destinations as word spreads. Where would you like to see JetSuiteX fly from Orange County? Have you flown JetSuiteX before? 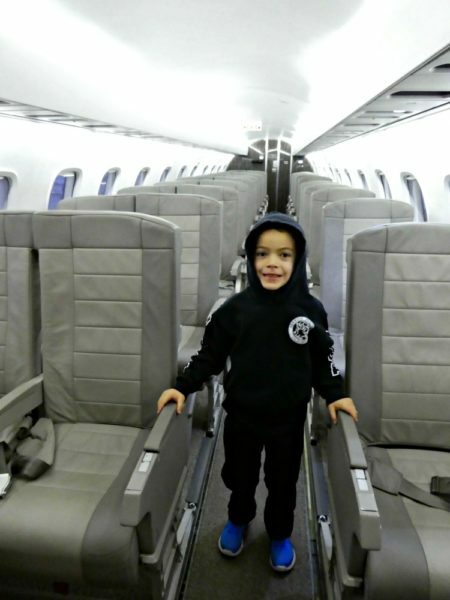 What did you like or dislike about your JetSuiteX experience? Let me know in the comment section below. it’s a bit odd calling Concord airport as SanFrancisco when OAK is far closer to SF than Concord is. A whole group of us would love it if JetSuiteX would fly from Orange County to Concord. There are already 2 routes from Long Beach to Oakland (Southwest/JetBlue), we need Orange County or even Long Beach to fly to Concord for more East Bay Area Options. I agree, Cecilia. JetSuiteX has been flying out of OC for less than a year (started in June 2018). As demand grows, they will certainly add more routes. Although Burbank is further away, I would make the drive from OC just so I could fly JSX instead of economy on a commercial airline.